A leading Saudi sheikh, Salman Al-Ouda is a former hard-line cleric turned advocate of peaceful coexistence. He is increasingly influential due to his innovative reach in the Muslim World propagated via IslamToday.net and his persistent efforts at ministering to the needs of the global Muslim community. In September 2017, Al-Ouda was arrested by Saudi authorities along with twenty other Saudi clerics for Tweets that were seen as offensive to the State. He is still imprisoned (including 5 months of solitary confinement), and the public prosecutor is now demanding the death penalty. 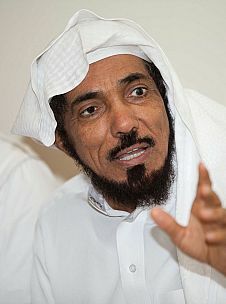 Key Scholar of Salafi Network: Sheikh Salman Al-Ouda is a leading scholar of the Salafi movement. Although he is not noted for propagating innovative ideas within the network, he has notable influence in the movement due to his use of multiple modes of education (the Internet, audiovisual media, and print) to educate the large body of Salafi Muslims in the Islamic sciences. Sheikh Al-Ouda’s website brings together a diverse range of Islamic scholars and educators to provide guidance in Islamic thought. Although he is by no means a figure of dissent and is loyal to the Saudi regime, Al-Ouda espouses reformist, pan-Islamic views and sentiments on his social media outlets. His far-spanning reach places him under added scrutiny by the political establishment. Influence Through Virtual Islamic Resources: Sheikh Al-Ouda supervises all content published on IslamToday.net—a website that offers virtual resources for Islamic education in multiple languages. His work has far-reaching impact in an age when religion is spread through media and technology, with IslamToday.net at the forefront of this trend. In response to a February 2010 ruling from the Al-Azhar Fatwa Committee condemning the use of Facebook, Sheikh Al-Ouda defended the social networking website, stating that he uses it to communicate with Muslims across the globe and to provide Islamic guidance online. Sheikh Al-Ouda has a following of over seven million fans on Facebook and nearly that many views of his official videos on YouTube. He also has over 16 million followers on Twitter. Innovative Educator: Al-Ouda developed a following from weekly talks at his local mosque in Buraydah and has become an authority for Muslims and non-Muslims worldwide who access IslamToday. net—a Saudi-funded website dedicated to providing Islamic educational resources in English, Arabic, French and Chinese. He also addresses Islamic issues on the Saudi satellite channel MBC. Ambassador of Non-violence: In an effort to distance himself from alleged connections to perpetrators of terrorism, Al-Ouda is outspoken about the importance of inculcating love and mercy as opposed to violence (except in valid cases of self-defense) in the daily lives of Muslims. As a prominent member of the International Union for Muslim Scholars, he led the delegation in talks with Arab heads of state regarding the need for them to unite in opposition to Israel’s siege of Gaza in early 2009. He has strongly condemned DA’ISH. He also called for peace and unity between members of the GCC and Qatar, which, led to his arrest alongside other clerics in a series of clampdowns on the religious establishment in Saudi Arabia. Innovative Educator: Al-Ouda developed a following from weekly talks at his local mosque in Buraydah and has become an authority for Muslims and non-Muslims worldwide who access IslamToday.net—a Saudi-funded website dedicated to providing Islamic educational resources in English, Arabic, French and Chinese. He also addresses Islamic issues on the Saudi satellite channel MBC.